Me has 2 new followers and me wants to tell them a big big thanks! So the poor ones that accidentally or not clicked the follow button are Star who's drifting drifting and Con Queso from the Cross stitching and game blog ! ... but I have to admit I kinda failed with the colours on this one. To be honest, while stitching these sprites, I never, even once, checked the actual colour numbers and just randomly picked some thread from my box. For now it worked wonderfully well. 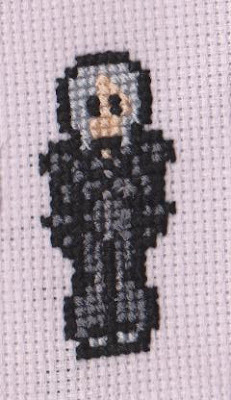 For the Kadaj pattern, that asks for 5 colours, I used 5 thread brands - black from Puppets, face colour from a bulgarian brand, and grays DMC (the hair - it was the actual number, lol!) Anchor and Ariadna. But it wasn't a nice shot. The grays on the coat are blending together, and the face kinda got that delicious melon color. I don't know yet, maybe I'll redo it tomorrow, especially if after a good night sleep my arms stop hurting. In any case, be sure that Kadaj will have his border. Why? Bah, do I need a reason to cage a bishie? Голямоото благодаря отива при Star от drifting drifting и Con Queso от Cross stitch and game blog!! И тъй като не обичам да пиша блог пост, без да сложа някоя картинка да е по-пъстричко, този път ще ви покажа Кададж! За днес смятах да показвам как завърших Гин, или новото Блийч чиби, което почнах, но щом видях, че на блога Dork Stitch e пристигнала нова доза от Final Fantasy, зарязах започнатия Бякуя (!!) и се пробвах с Кададж! Обьче този път нещо не налучках цветовете. Трябва да призная, че докато правех предишните, нито веднъж не погледнах истинските номера на цветовете, а просто си избирах някакви от кутията с конци, и тази тактика работеше доста добре засега. За Кададж, за когото са нужни 5 цвята, в употреба влязоха 5 марки конци, от които изненадващо DMC-то беше истинският номер. Но със сивите не уцелих, защото се сливат, а и нещо цветът на лицето подозрително напомня зрял пъпеш. Може и да ми скимне да го пренаправя утре, особено ако ме отболи ръката. Публикувано от Topcho в 16:41 ч. 8 февруари 2011 г., 18:29 ч.
Wow, I think this is the fastest I've ever seen one stitched, and even if you did use different floss, the colors look spot on to me! I'm really glad you liked the chart, and it looks fantastic, too! 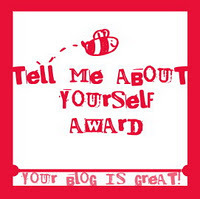 8 февруари 2011 г., 21:26 ч.
lol, thanks for the recognition. I can totally relate to picking colors by "feel" rather than the DMC number...mainly because I don't want to spend $100 to grab them all, haha. I'll show you what I made sometime that I eye-balled. 8 февруари 2011 г., 21:49 ч. 9 февруари 2011 г., 5:03 ч. He looks so cute! What a fast finish!!! Thanks for the link to the finished pic of your other project - where did you find the pattern? It's beautiful! 9 февруари 2011 г., 11:21 ч. Spring in Japan WIP update! Curiouser and curiouser! I'm so cheap `11 p2! And now we have a tiny Seph to join the party! Cause I aaam Clooud, my hair defies all gravity!